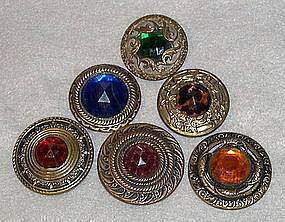 Button collectors here is jewelry for your garments or your competition tray. All circa 1900. Note: Assorted prices. (C) Two Crescent moon shooting start steel cups 1 3/8". 19 Each - Minimum purchase of 59 dollars. $10 USPS Priority/Ins/Tracking or Free with USA Ck or USPS MO. See two 35mm crescent and shooting stars steel cups on 4,5,& 6 and the fabulous bold one as image 3..